Graphics, Copywriting, Printed Materials and Narration by Alev. Website Programming, Video and Animation by Richard. 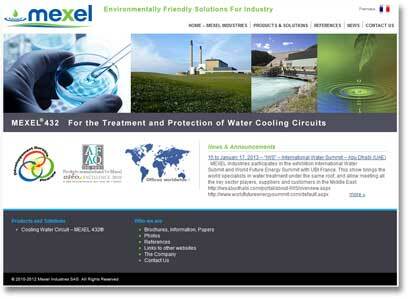 Mexel USA, founded by Jean-Pierre Schwartz and Mary Wolter Glass, is the exclusive distributor of the technologies and products developed by Mexel Industries S.A. in the United States. Their primary product is a revolutionary Chlorine-Free Water Purification System that is widely used by municipalities, power plants and ships. A sleek new corporate website, trade show DVD production services, copywriting for both the website and DVD, and a complete stationary package.